Happy New Years Eve! If you have arrived her from Denise's Blog then your in the right place! If not and you would like to start at the beginning of the hop click here! There are 35 blogs on this hop, many offering blog candy so make sure to check them all out! So the theme for this hop is "Thank You" cards. I recently got some new Martha Stewart border punches so I wanted to use them on my card. Also, I've been wanting to do a sun card for awhile now.. This sun is cut from Create a Critter. I love the colors of this card, and for most of it I was able to use scraps! The "Thank You" stamp if from the Thanksgiving stamp set from Pink by Design (pinkcricut.com). 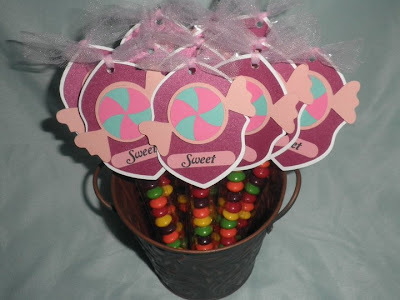 I do have blog candy up for grabs although I don't have a picture of it. Its some clear birthday stamps and it has some cute bee's on it too. To qualify to win you have to be a follower and leave a comment. Please include your email address as well so I can get in touch with you if you win. Next stop is one of my friends Theresa The Scrapbooking Queen! She has an adorable card for you! Enjoy the hop and Happy New Years! I hope everyone has a wonderful 2011! Yes I know its not even January and I'm already making stuff for Valentines Day! :) I love it because I get to use lots of Pink! These are M&M Valentines! Inside each one is a fun size M&M pack. The tag is alittle over 3 inches tall. The entire thing is about 4 1/2 inches tall. I crimped the top and bottom. I also used Tulle to tie the tag to the bag. The scallop circle and circle are cut from Storybook. The heart is cut from Sweethearts. 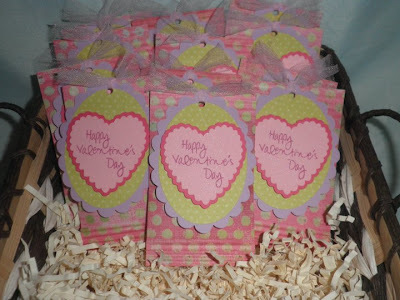 I used glimmermist on the light pink heart and "Happy Valentines Day" was stamped using Memento ink. The sentiment comes from the Love Always Pink by Design stamp set. 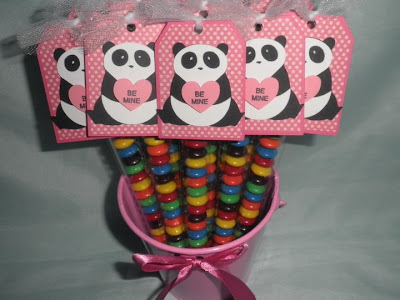 Panda M&M Sticks! These can also be made with Skittles. The tags are cut from Tags Bags Boxes and more. The Panda is cut from Pagoda and the heart is cut from Create a Critter. The stamp is from Stampin Up "Cute Converse" I believe..
Merry Christmas everyone! I wanted to share a project I made for my Niece for Christmas! First lets start with the present! My Niece always enjoys getting handmade gifts from me so I had to make her something to go along with her other presents! I decided to make her a notepad with index cards in it. The Ice Cream cone is cut from Simply Charmed. And of course I had to wrap it all cute with a homemade bag! This bag is cut from Wrap it Up. The tag is cut from Winter Frolic. Hello Kitty is from Hello Kitty Greetings, The red background piece is cut from Gypsy Wanderings and the green oval is cut from Storybook. Lots of cartridges used on this project! Here is a close up of the tag, I used my white pen to add little dots to give the tag alittle something extra. And a close up of the bag.. I inked the green oval with a silver ink to give it a more Christmasy feel. I also used my I-Rock to add gems to Hello Kitty's outfit. I then used my hot glue gun to add the flowers and leaves. I hope everyone has a very Merry Christmas!! I wanted to share with everyone a new card I created with Pink by Design stamps! Here is a picture of the new stamps I just got today! If you don't have any of these stamps yet, you should order some! They stamp very clean and so far none of mine have turned yellow! I just had to tear open Take the Cake and use it ASAP! Obviously the stamp inspired the card! Thanks for checking out my card! Also, I am having a Giveaway on my facebook page! Become a fan and refer your friends for a chance to win Birthday Bash cartridge! No project today for FCCB.. we get two weeks off! I will be posting some new Valentines Day treats soon though! :) I hope everyone has a very Merry Christmas! 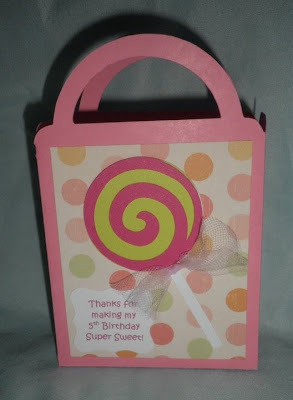 Here is the Favor Box.. It was cut from Plantain Schoolbook if I remember correctly.. but I know there are other cartridges that have boxes similar to this. The lollipop is cut from Mickey & Friends. 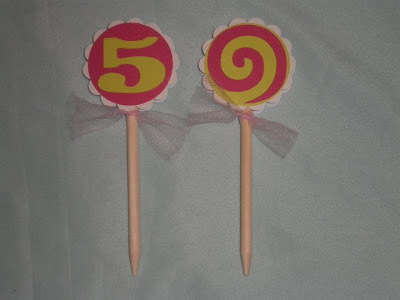 Next up are cupcake toppers! 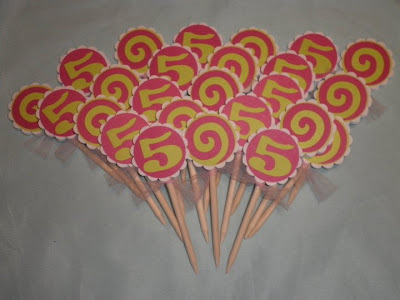 They have a 5 on one side and the lollipop image on the other side. I used my Stampin Up circle and scallop circle punches. Perfect size for this project! I think the 5 was cut from Cindy Lou. And skittle sticks! I changed up the colors a bit. I didn't want it to be all pink and green. These also match the banner. The candy was cut from Simply Charmed. The background image (purple and white) were cut from Gypsy Wanderings I think and then I stretched the length on them with my Gypsy.